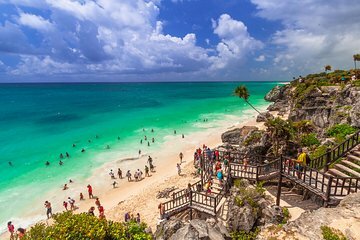 On this hassle-free day trip you're whisked from Cancun, or your Riviera Maya hotel, directly to the Maya ruins of Tulum. Don't worry about arranging travel or following a rigid itinerary. You'll explore the ancient sites at your leisure, and your driver will stop if you want to grab a bite to eat. Before traveling back to the hotel, enjoy a night show at Xcaret, and take advantage of the nature park's outdoor activities. We offers this tours a Cancun and Riviera Maya. Hotel pick up is up to you. We suggest 7-8 am. Wheelchair accessible at xcaret park not Tulum.